Isaac Seumalo has a lot of potential at center, but needs to get his high snaps under control. Isaac Seumalo snapped a ball over quarterback Joe Callahan's head in the Eagles' preseason opener last Thursday. This was not a shock to anyone who has kept tabs on Seumalo's training camp. 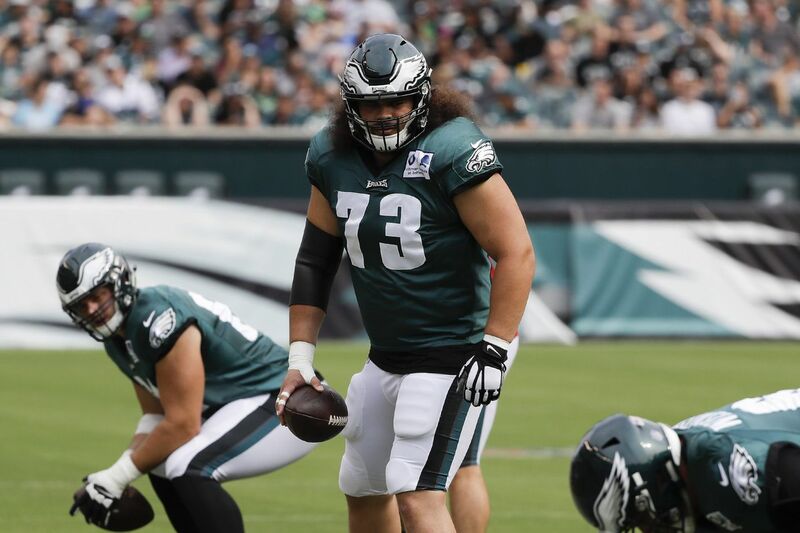 Jason Kelce's backup has tended to launch one into the wild blue yonder every now and then – as offensive coordinator Mike Groh noted, always on running plays. This adds to a discouraging image of the team's 2016 third-round draft choice, the first player after Carson Wentz that Howie Roseman drafted upon returning to power. Seumalo was the starting left guard at this time last year, but he looked woefully overmatched and lost that job to veteran Stefen Wisniewski two games into the season. Now, back at the position he says he is most comfortable playing, he's snapping the ball wildly. Not all the time, but often enough for concern. The thing is, offensive line coach Jeff Stoutland and Seumalo's teammates say he is having an excellent training camp, except for that one little detail, which could, of course, portend disaster in a real game. Stoutland lauded the power and strength Seumalo worked hard to gain in the offseason and said it was important to "evaluate the whole body of work." "If you ask any player in our locker room on the offensive line, they'd tell you the same thing: He's probably the most improved player right now. That guy's having an unbelievable camp," Stoutland said. "Then he goes and snaps the ball over the QB's head and we lose 17 yards on a run, which was wired – the run was going to be a good run. "Isaac is very conscientious, he's very intelligent. He's got Kelce ability with setting protections and all that stuff. … When he gets all excited a little bit, that's when something like that happens. The one thing Isaac will do is, he'll learn from that." Seumalo, 6-4, 303, said he understands the high snaps have to stop. "I know the coaches and guys are concerned about it. I'm going to work on it, and it will get fixed," he said. "I'm 100 percent positive about that." Seumalo has been working with Kelce and Wisniewski, who was a starting center in Oakland and Jacksonville before coming to the Eagles in 2016. "He's an incredible athlete. He's got great size, great hands, great intelligence. He really is suited extremely well for the center position, I think," Kelce said when asked about Seumalo's potential. "He can play guard, tackle, center, extra-man tight end, and that's incredibly valuable for any team, especially as a guy coming in off the bench. But I firmly believe that just as a pure center, he's probably better than a lot of starting centers in this league. He's got a lot of potential at that position." Wisniewski said the only way to iron out such problems is repetition – not off to the side with a teammate, but in live practice drills. "You really need repetition going full speed. If you just practice snapping going half-speed and you're just thinking about the snap, that's kind of easy," Wisniewski said. Kelce said Seumalo's snapping high only on run plays isn't a coincidence. "Every center's gone through [snap problems] from time to time. When they tend to go high, they're usually on run-blocking plays. … Your hips get higher. You're trying to come out of your stance. You'll notice, most low snaps happen on pass-blocking, because your hips are down and you're getting ready to retreat," Kelce said. "The only way to rectify it is to continually go full speed in all snapping drills, do seven-on-seven, and really just continually run-block on air, and continue to ask, 'How was that snap?' Try to finish lower, try to not use your wrist as much. He tried taping his thumb out [for Saturday's practice], I don't think he liked it too much. For me, when I tape my thumb down to my wrist, it limits how much I'm using my wrist. In turn, that helps not take the ball high. I actually have a problem with 'em low sometimes, and that's on pass-blocks. "You just try to work on it. I know when I get a really tight shade, like a guy head-up on me, and I want to get my hand up quicker, I have a tendency to short-arm, and to get my right hand back quicker [to block]. That's when I have a tendency to go low." Hand placement, grip – there are all kinds of things a snapper can tinker with, and that is what Seumalo is doing right now, sometimes with adverse results. "I'm kind of in the midst of testing out stuff, which isn't a great thing to do," Seumalo said, in terms of being accurate and consistent. "Different ways you can hold it and snap it, what I'm thinking when I snap it. The important thing for me, because I've been playing so well, playing fast, I don't want to start playing a lot slower. The snaps might be better [but blocking would suffer]." Like Wisniewski, Kelce emphasized that these details have to be ironed out in practice, so that they come as second nature. You don't line up in a game thinking about mechanics. "It's too late if you're worrying about it in the middle of a game. You don't want to ever be out on the field being like, 'OK, I need to focus on the snap,' because there's so many other things, especially at the center position, that you're in charge of and trying to get set," Kelce said. "You really need to 'hound' on it in practice, to the point where you get it to become muscle memory. … That's the only way to really fix it, in my opinion."